Goal : Gathering Two-dimensional landmark coordinates to describe the shape of my favourite structure. Here I am going to give the basic workflow for how to gather 2D landmark data (comprising x & y coordinates for p landmarks) from points placed by hand on photographs of my structure of interest. For example, here is a Salamander head, courtesy of Dean C. Adams. To capture the shape of the head across species, we can use landmarks to mark out homologous structures, such as the corner of the mouth, the posterior edge of the eye, etc. In order to gather these data for statistical analysis (geometric morphometric analyses), we need to have a well-ordered workflow setup. Here is a standard workflow for collecting these 2D landmarks. 1. Gather up all of your specimens and decide on what structures you want to study. Look at the variation among them, and like taxonomic classification make note of what parts are varying across the samples. Importantly, for landmark-based geometric morphometrics, only structures that are there in all specimens can be digitized. For discussion on estimating missing structures see here. For discussion on "homology-free" data see here. Make a numbered list of the landmarks you will measure, and be descriptive so that you know your exact criteria for marking each landmark. 3. Photograph the specimens. This will be very specific to your structure of choice. Consider a macro lens for small specimens; for deep specimens, a camera with the capability of preparing composite images, e.g. using Auto-Montage. To overcome issues of parallax, it is better to image all your specimens in one session, or in a short period of time. File formats: Any high-quality image format, e.g. tiff, bmp or jpeg are recommended. Note that geomorph R package currently only reads jpegs. a. Start with the genus and species: "H_sapiens_"
b. next add the specimen ID: "H_sapiens_01234_"
c. now add whether it is male or female: "H_sapiens_01234_female"
d. now add the side and the file ending: "H_sapiens_01234_female_left.jpg"
Down the line will make it far easier to navigate through all of your images and specimen data. Now you have all of your images, BACK THEM UP! a. geomorph R package function ﻿digitize2d(). My user guide for this function can be found here. b. imageJ. A comprehensive guide by P. David Polly can be found here. c. tpsDig2 A comprehensive guide by the anyFISH group and Gil Rosenthal can be found here. When digitizing, make sure to keep the order consistent with every single image. This is why your list of landmarks will come in handy. And if at all possible, keep digitizing to a single person. This will minimise measurement error due to different people's perspectives on where the landmarks should be. Good practice is to measure digitizing error. 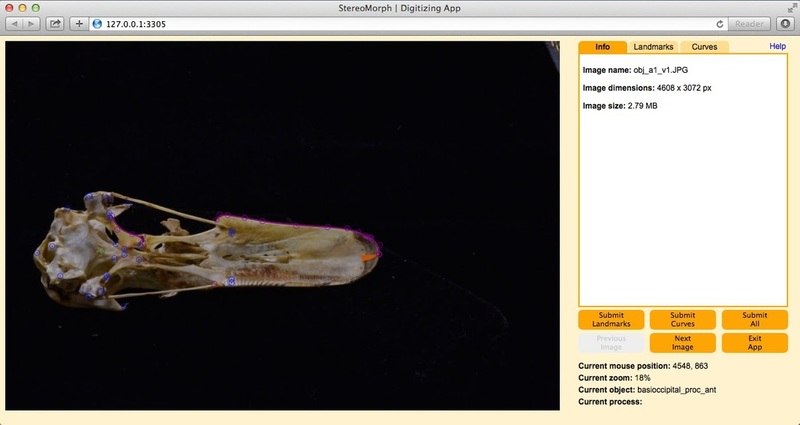 Digitize 20 specimens twice, and compare the two sets of landmarks using a Procrustes ANOVA (e.g. geomorph function procD.lm). This will give you a sense of how variable you are being with your digitizing and give you a measure of the variance from human error. This is vitally important for studies of fluctuating asymmetry, but also important for any morphometric study. Also good practice is to throw away and repeat the first 20 specimens you measure, or as many as you feel you can do before it feels natural and repetitive. This is similar to the "burnin" period of phylogenetic analysis.